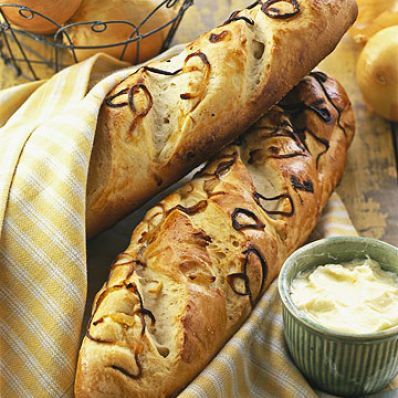 1 of 2 Combine bread and all-purpose flours, yeast, sugar, onion powder and salt in large bowl. Stir in very warm water and oil. 2 of 2 Transfer flour mixture to work surface. Knead until well blended and dough is stiff, about 10 minutes, adding more flour as needed to prevent sticking. Transfer to greased bowl, turning to coat. Cover with clean kitchen towel or plastic wrap. Let rise in warm place until almost tripled in volume, about 1 1/2 hours. Dust baking sheet with cornmeal and set aside. 1 of 4 Meanwhile, as the dough rises, bring small saucepan of water to boiling. Add sliced onion; cook until softened, about 8 minutes. Drain. Sprinkle with salt. 2 of 4 Once dough has risen, punch down. Let rest, covered, 10 minutes. Divide dough in half and shape into two 12 x 2-inch loaves. Transfer to baking sheet. With a razor or very sharp knife, make 4 diagonal slashes in each loaf. 3 of 4 Whisk together egg yolk and milk in small bowl. Brush over loaves. Top with onion rings. 4 of 4 Place bread in COLD oven. Turn oven on to 400 degrees F. Bake for 35 to 40 minutes or until loaves are puffed, golden and sound hollow when tapped on bottom. Transfer to wire rack to cool slightly.